SpicePress is beautiful, modern and highly creative business template. SpicePress is specially designed for creative and corporate websites, restaurants, wedding planners, law firms, finance, consulting, travel, photography, recipes, design, sport or medical shops, startups, online agencies, portfolios, E-commerce (WooCommerce), and freelancers. The advanced admin panel will enable you to personalize SpicePress without any technical information. 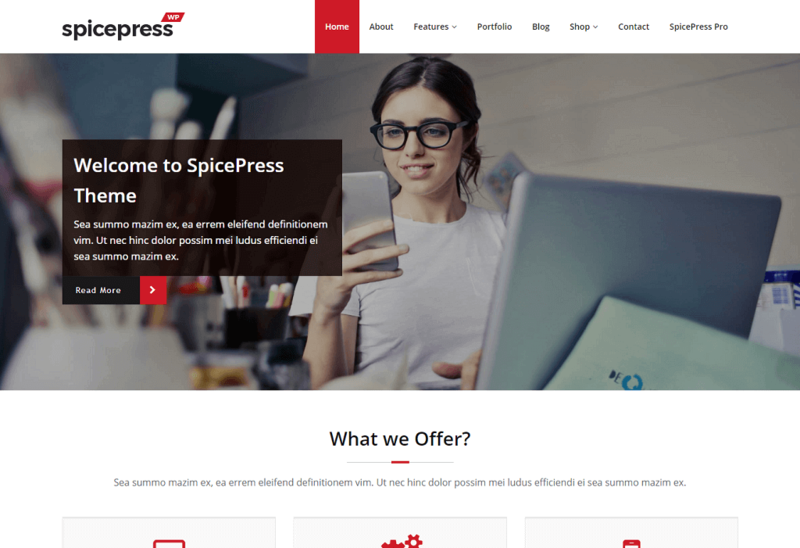 SpicePress is fully responsive and elegant theme. It supports all kind of devices from desktop to mobile. SpicePress provides various features to its users like it is translation ready and it supports popular plugins like WPML, Polylang, WooCommerce and Contact Form 7. You can also check out SpicePress PRO, the premium version, which will be provides you lots of offers.